The Australian Institute for Teaching and School Leadership (AITSL) has developed a comprehensive set of videos known as Illustrations of Practice for teachers and pre service teachers to address effective practice in a range of contexts. Each illustration targets a different Standard and links to the Australian Curriculum where relevant. Take a look at this highly accomplished teacher in action using Scootle resources. 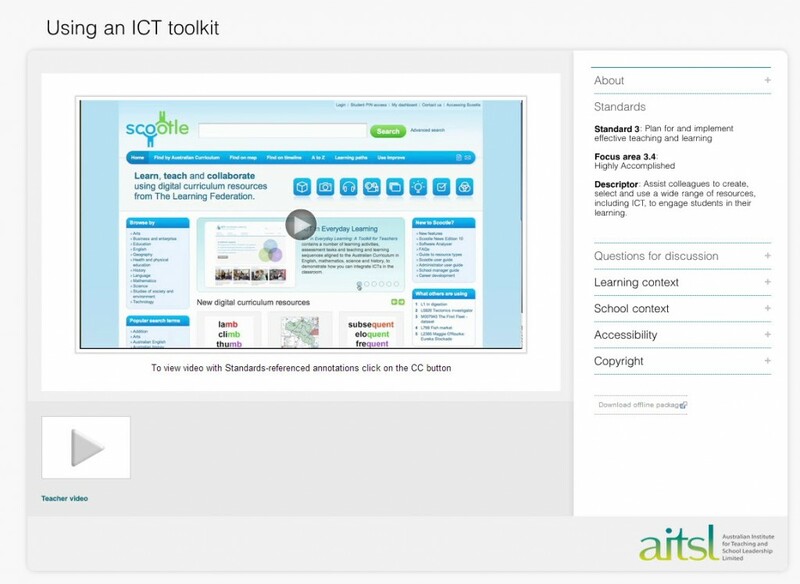 ICT In Everyday Learning: A Toolkit for Teachers Resource ID S4977 can be found in Scootle. 1. In what areas do you need to develop confidence or competence in the use of ICT for learning? 2. Which ICT resources or tools have you found most useful for engaging students in their learning?